Surrealist sculptor Scott Hove has become famous for his fantastic fake cakes and cake-like sculptures that he creates using carved foam and traditional cake decorating tools. Spoke Art Gallery in San Francisco is currently showcasing his latest works in a highly topical exhibit entitled Guns & Ecstasy. 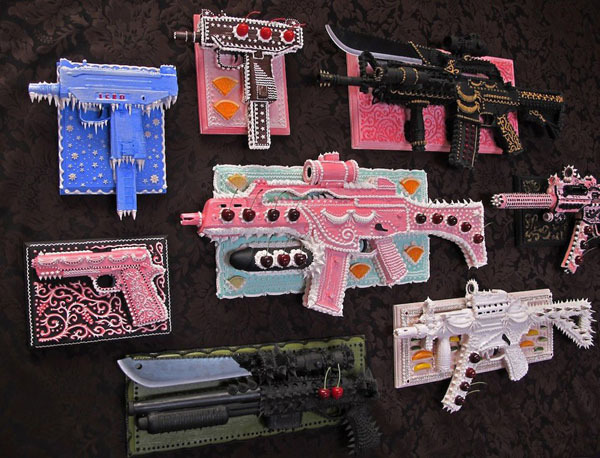 In addition to a fully immersive, single person Cake Installation that Hove calls “A Pentagonal Disco Infinity Chamber” — and which features multiple angled mirrors and a spinning disco ball — the exhibit includes a series of twelve confectionery assault weapon sculptures created in light of the recent shootings and gun violence in the United States. If I lived in the area, there is certainly no way I would miss this show. 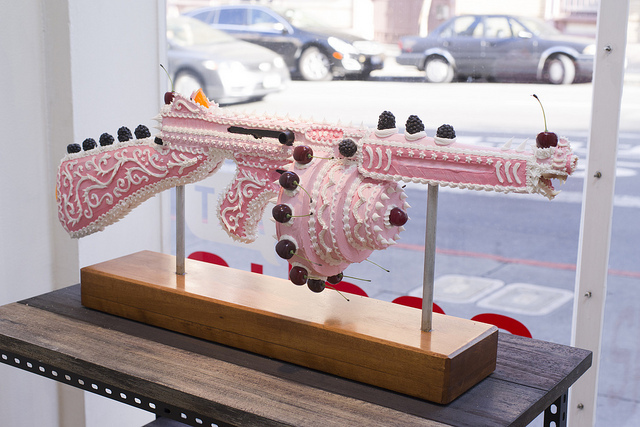 Scott Hove’s Guns & Ecstasy exhibit runs through May 25th, 2013 at Spoke Art Gallery, Located on 816 Sutter Street, San Francisco, CA 94109.